Locks Gallery is pleased to present Weave and Fold, an exhibition of new sculpture and prints by Alyson Shotz. A reception will be held on Friday May 6, 2016 from 5:30 to 7:30pm. For Shotz’s third solo show at Locks, the artist continues to investigate the formal and material limits of perception. Often working in series, Shotz presents three new bodies of work that relate to the acts of weaving and folding. 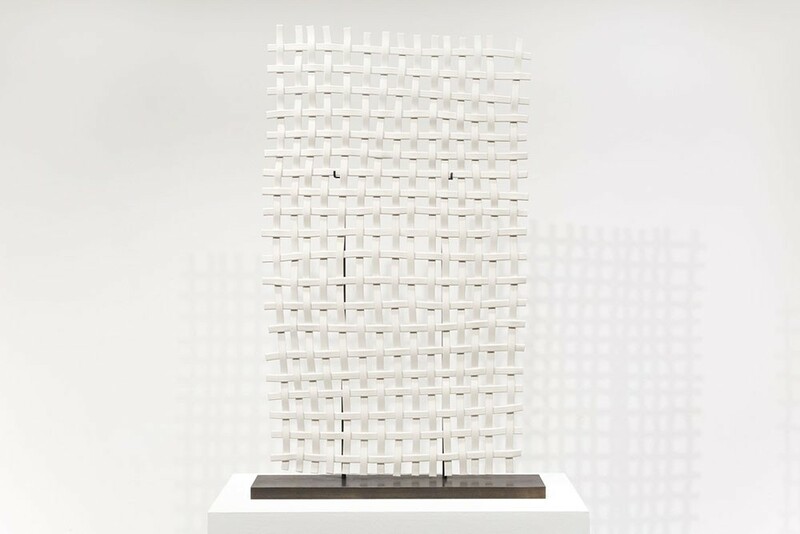 The Draughtsman’s Net (2016) is a series of freestanding woven porcelain “nets” that make reference to Albrecht Dürer’s 16th century drawing instrument and call to mind the laborious process of transforming 3-dimensional space to a 2-dimensonal picture plane. Shotz’s simply structures are made with an unconventional choice of material—extending the traditional applications of ceramics into a sculptural form that evokes an industrial fence. Black Folds (2014) is a series of hand-folded aluminum sculptures that also disrupt our initial perception. Here she takes a common commercially available material—lightweight sheets of aluminum—and transforms it by hand, as if it were paper. The Black Folds are inspired by the artist’s early origami studies and continue the visual dialogue of folding, explored in Shotz’s color aquatints from the Sequent series (2013), also on view. Alyson Shotz received a BFA from the Rhode Island School of Design and an MFA from the University of Washington in Seattle. In 2012, Shotz was the Sterling Visiting Professor in the Department of Chemical and Systems Biology at Stanford University. Shotz’s recent solo exhibitions include Force of Nature (Ruth and Elmer Wellin Museum of Art), Alyson Shotz: Fluid State (Indianapolis Museum of Art) and Alyson Shotz: Ecliptic (Phillips Collection, Washington, DC). Her work is included in numerous public collections, such as the Solomon R. Guggenheim Museum, New York, the Hirshhorn Museum and Sculpture Garden, Washington, DC, the Whitney Museum of American Art, the San Francisco Museum of Modern Art, and the Indianapolis Museum of Art, Indianapolis, IN, among others. 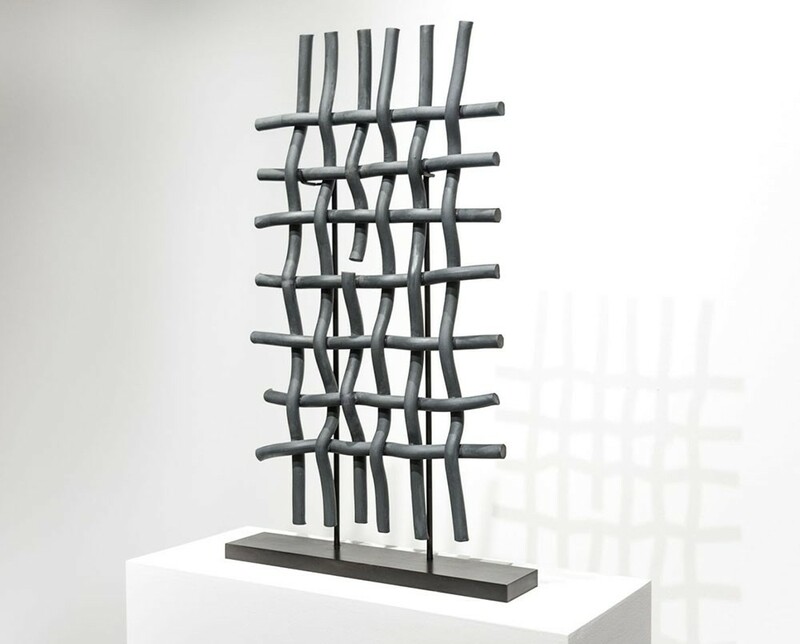 The exhibition at Locks Gallery is concurrent with Alyson Shotz: Plane Weave at the Pennsylvania Academy of Fine Art. Portfolio of 5 color aquatints with collagraph embossing. 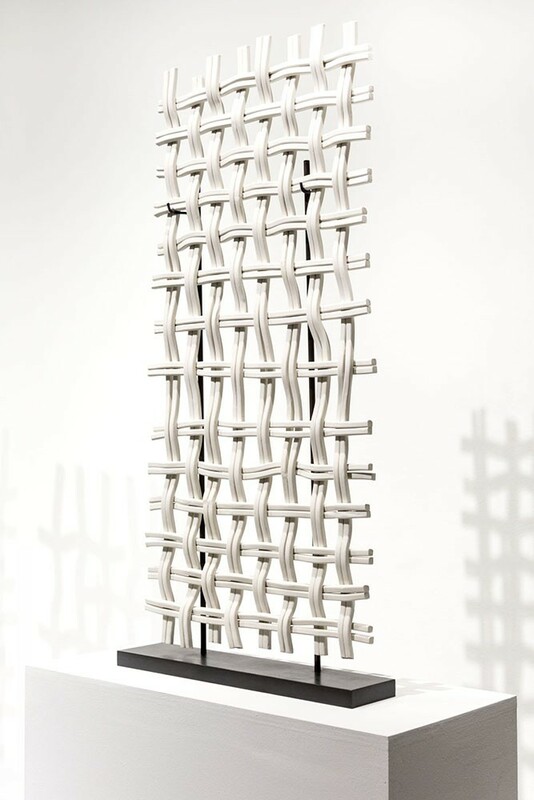 Woven porcelain on steel base. Hand folded aluminum and paint.